The first shot of the movie, at least from our perspective, showed a group of people looking at a painting. After a split-second, it was revealed that the individuals were simply waiting for the elevator in which the painting happened to be next to. I wish the entirety of “(Untitled),” written and directed by Jonathan Parker, was more like the opening shot because it took advantage of our expectations and what we were seeing. The film happened to hit good and sour notes. On one hand, I thought it was really funny. 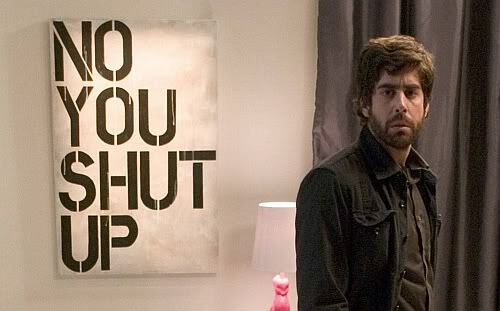 I laughed out loud at the scenes when the main character, Adrian (Adam Goldberg), would play avant-garde music with his band and the audiences in the picture were simply shocked with what they heard. Or worse, that they actually paid to listen to it. The music Adrian and company played was like a group of toddlers randomly banging kitchen utensils. It was painful to the ears and most people would just wish for it to stop. Another reason why I thought it was funny was because the lead character took himself so seriously. He had real insight about his place in the art world and I thought his ideas were revolutionary. On the other hand, the romantic angle between Adrian and the posh art gallery dealer (Marley Shelton) felt forced. Their interactions felt too convenient; it felt like an awkward tool that served to keep the plot running along. I thought it was odd that the characters talked about hating commercial work but at the same time the movie they were in, whenever it focused on the romance, felt exactly like a quirky romantic comedy. Instead, I wish the movie had spent more time exploring the sibling rivalry between Adrian and Josh (Eion Bailey). Not just because both men liked the same woman but also because of their style of art. It would have been more fascinating because Josh was everything Adrian was not. I was interested in their history such as the environment from where they grew up in and the various inspirations they embraced that shaped their respective artistic endeavors. As a satire, “(Untitled)” marginally succeeds. Unlike Duncan Ward’s insular “Boogie Woogie” that tackled essentially the same issues, “(Untitled)” was equally about the images and sounds we saw or heard and the people that produced them. Even though everyone was flawed, I understood where they came from and I felt the passion toward their work. There was a wonderful scene near the end when Adrian attended a concert and later he was inspired to actually make progress concerning his own project. The inspiring moments were small but they resonated. I enjoyed at film in a number of ways and I hope others will take a chance to see it.